For all four people that care avidly about Borderlands lore: Tales from the Borderlands' penultimate episode will deploy alongside a bad gag or six on 18th August in Europe and North America. The most riveting series in Telltale Games' ever expanding portfolio of franchise tie-ins will find protagonists Rhys and Fiona in hot pursuit of that MacGuffinest of MacGuffins – the Vault Beacon. We're probably being a teensy bit harsh as we've been moderately fond of this spin-off so far, but when you've got DONTNOD utterly outclassing the American developer in practically every department, one has to question what the studio's doing faffing around with franchises such as Borderlands and Minecraft. Sigh, so much wasted potential. Life is Strange is killing it. Seriously, its GOTY contender for me if you don't count Bloodborne. Tales is a fun game but it doesn't even come close to the emotional impact of LiS. LiS made me angry, sad, happy and the episode 4 cliffhanger is probably the best cliffhanger in games EVER. @AyeHaley See, this is it. 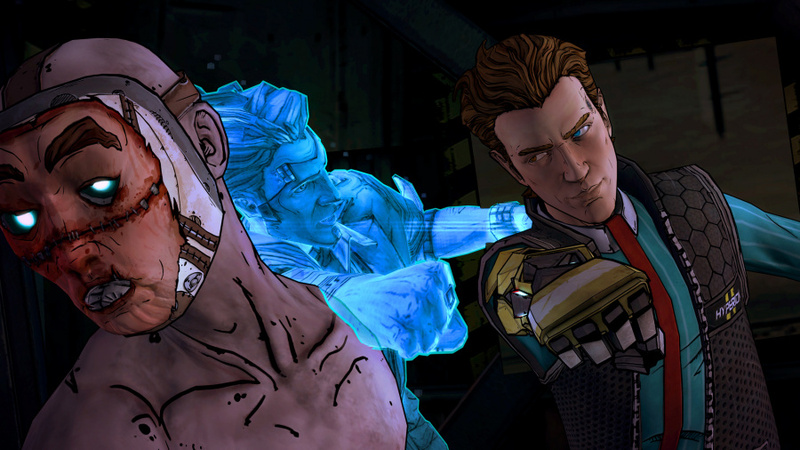 There's nothing wrong with Tales from the Borderlands, other than the fact that it doesn't really need to exist. It's perfectly fine, acceptable, alright - but Telltale's capable of so much better, and it's selling itself short with all of these partnerships it's creating with ill-deserving brands. @get2sammyb The first episode in tales from the borderlands was the best tales episode I have played. But its taken too long and the episodes 2-3 have been boring and the main characters although fun at the start have really started to grate. I must play life is strange. I like this series. I'm not a Borderlands fan at all, in fact I'd say I tend more towards "disliking" than "liking". I don't think it's fair to say "why choose Borderlands as a setting?" though. I mean, why choose the Pacific Northwest as a setting? A small sleepy town that's got an ailing fishing industry doesn't exactly sound like a riveting setting either. I'd also argue that LIS didn't really take full advantage of its time travel concept until the end of Episode 3. It was certainly enjoyable and convincing but ultimately you were mainly just controlling a pretentious student around a few small areas and doing your best impression of American Beauty who spends all day filming plastic bags blowing around in the wind. That said, it certainly flows a lot better than TFTB does. Tales seems to jolt from one sketch to the next, sometimes I'd have to remind myself why I was in the current location. The sometimes relentless QTEs are annoying as well. I think where DONTNOD seem to stand head and shoulders above Telltale is that they're created their own original property. Telltale have always just made quite cheap feeling licensed tie-ins. They didn't really have a good reputation at all prior to TWD. Their Jurassic Park game is seen as horrendously bad. I think one thing we can say for them (at least TWD onwards) is that they actually seem to improve on whatever they've licensed. TFTB has a far better story than Borderlands proper, TWD is much more affecting than the comic, TWAU is better than what I've read of Fables. I think it's just GoT that might not be better, but that's quite an ask. I bought the first episode about 6 months ago and it was really great, I'm just waiting for the complete season and for it to come to Vita. I like playing my Telltale games on Vita. This is actually one of my favorite telltale series. I watch as my wife plays all of them and this seems to be one of the more engaging ones. Actually, I didn't like Borderlands 1 and this is what made me give Borderlands 2 a chance and I love it. We haven't played Life is Strange, yet though. We played the demo just this week and she seemed to like it - we're waiting for a sale at this point, though. In-terms of game play I find this the most fun of any of the TT games. I know they are just QTE's but I think they are well done. My only issue with this game has been the wait time between episodes. Way too long. I liked it better the way Capcom did things with RE Revelations 2. A new episode each week with a physical release of the complete season once everything was available digitally. This is easily Telltale's best work. What's wrong with them using Borderlands?